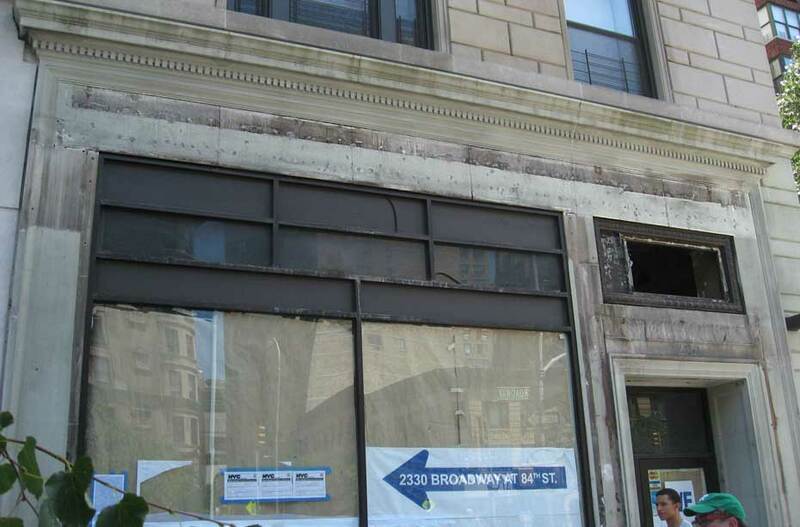 In july 2011 peering faintly over a shop front undergoing maintenance at Broadway and 81st St. was this sign reading CORN EXCHANGE BANK TRUST CO. The Corn Exchange Bank was established in New York City in 1853, and they converted to Corn Exchange Bank Trust Co. in 1929. In 1954 they merged with the State Chemical Bank & Trust Co., and their name changed to Chemical Corn Exchange Bank. In 1959 the "corn" was dropped, and they became Chemical Bank New York Trust Co., and then in 1964 simply Chemical Bank. The Corn Exchange Bank branch at Broadway and 81st St. opened in 1924, and it remained here through various name changes until 1990. The sign using the bank's name as of 1929 very possibly dates from that time.